LaTriel White is known for her virtuosic ability to perform fluently on the clarinet within the worlds of orchestral and chamber music, while at the same time working feverishly as a saxophonist and flutist in the varied genres of jazz, rock, and other modern music. Over the past three years, she has become a fixture in the live music landscape of Houston, Texas. 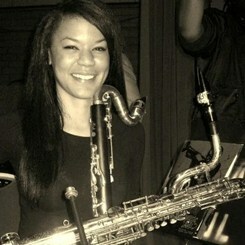 While her earliest work was with such established local performing groups as the Conrad Johnson Big Band, Paul English, and nationally with five-time Grammy Award Winner Dennis Edwards, it was her two-year stint with the Joe Sample Jazz Orchestra that elevated her profile as a serious multifaceted woodwind artist. As the baritone saxophonist is the JSJO, she also navigated the rigors of Mr. Sample's chellenging repertoire on flute, clarinet, soprano sax, and bass clarinet. Presently, Ms. White is the Artist Teacher of Clarinet and Saxophone and Interim Professor of Woodwinds at Texas Southern University (Houston, Tx). In addition to her dutiies there, she maintains an active private studio and performs as a freelance musician in concerts, recording sessions, clinics, and workshops in the Greater Houston Area and abroad. She is deeply involved in the creation of classical and jazz genres. Ms. White helps dedicated students of all levels refine their clarinet and saxophone playing through the correct usage of emouchure, air, and hand and finger technique. She believes that the proper mouthpiece, reeds and other equipment all play an essentail role in development. Request Lessons with LeTriel today!